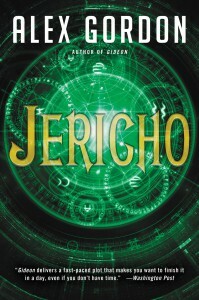 JERICHO continues the story of witch Lauren Reardon. In GIDEON, Lauren learned that there were many “thin places” in the world, and that she would be called upon to heal them and face the evil that sought to force its way through them into this world. When she takes a walk through the Gideon woods one day and finds herself in an Oregon forest, she believes at first that she is dreaming. But she knows that a witch’s dreams are harbingers not to be ignored, and she returns to the Pacific Northwest to learn the reason for her vision. People had long whispered about the abandoned logging camp of Jericho, of the disappearances, the strange sounds heard in the woods at night. But the ghost stories and urban legends only hint at the evil lurking in the ruined buildings, the wooded trails, an evil with roots in both ancient times and a millionaire’s bizarre beliefs. An evil that Lauren never imagined could exist, and that she must face even at the risk of her life, and her soul.